Toronto: After three days of drama, Punjab Congress chief Captain Amarinder Singh has reportedly cancelled his seven-day trip to Canada. The decision reportedly came in wake of the prospect of possibly facing a case related to torture in a court in Toronto. That decision came on Saturday, after Capt. 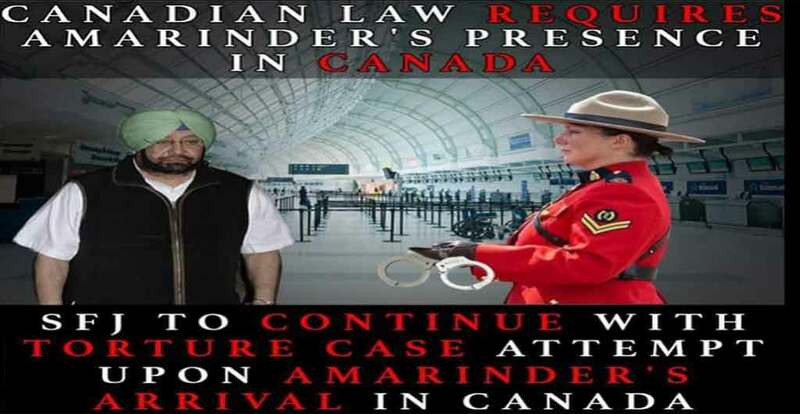 Amarinder Singh had already postponed his arrival in Toronto as he waited for the court to issue an order before he decided on his course of action. The case was filed by the activist group Sikhs For Justice (SFJ) on behalf of a Canadian resident, who was allegedly tortured during Singh’s tenure as chief minister of Punjab. An official statement released by Amarinder Singh criticised Sikhs For Justice. Accused by SFJ for human rights abuses in Punjab, former CM alleged that SFJ was playing into the hands of the anti-India forces like the ISI to embarrass India. and project as if rights violations were the norm of the day in the country (India) like some dictatorships in different parts of the world”.